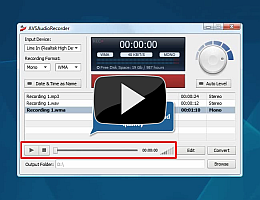 AVS Audio Recorder is a useful audio program that lets you record your own voice, music or any other sound. It supports recording from a microphone, external input devices such as a CD, cassette player, as well as other audio applications. work with your recordings: playback audio, view file information, perform certain file operations and use external applications for editing and converting audio files. To start AVS Audio Recorder go to Start menu and follow All Programs -> AVS4YOU -> Audio -> AVS Audio Recorder. How to rip old home tapes? How to record audio using Stereo Mix? What is in AVS Audio Recorder?